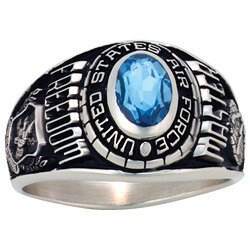 Honor your service with the premium silver Venus military ring. Personalize the wording around the stone, stone color, side emblems and engravings. Manufactured by Balfour. This ring is made of Premium Silver. Make your military ring yours! Display your combination of specialty, rank, unit or division before you buy. Please note: Orders containing inappropriate language / profanity may be refused at the sole discretion of the manufacturer. Rings cannot be made with identical side emblems. Choose your branch of service. We have an incredible selection of designs for your stone surface. The laser vue is etched on the top of and its color will match the metal color of your ring. View select designs. Choose your side emblem design. The engraving options for that emblem design are below. Customize the ring with your name, personal, space. All engravings appear above the side emblem design. Customize the ring with your years of service or rank. All engravings appear above the side emblem design.